We have seen a lot of successful games with the superheroes universe like DC Unchained or Marvel Future Fight. In addition to the fans of action games, this game also attracted movie fans and comics(like me). I do not know what you like, but I like controlling characters that I love in popular movies. Today, I want to introduce you a new product of the publisher PerBlue Entertainment called Disney Heroes: Battle Mode. No superheroes, no Avengers, this game has the theme of the hero in One Disney cartoon. Now, Let’s come back to their childhood with this interesting game. 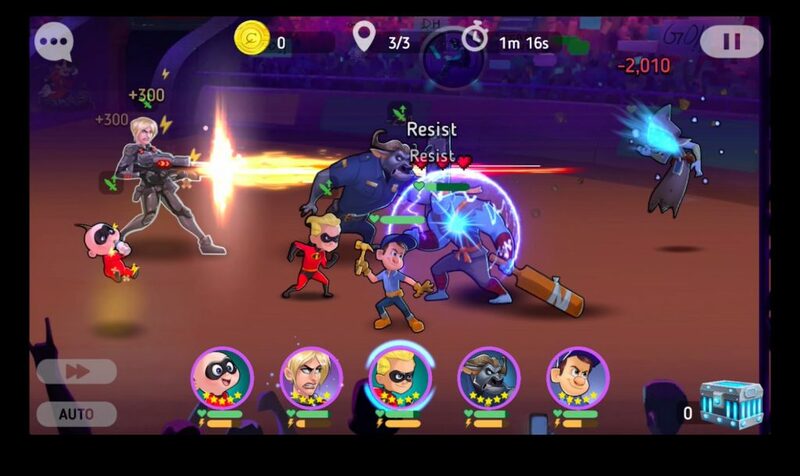 The story of Disney Heroes: Battle Mode revolves around superhero characters who have special abilities to appear in Disney cartoons like The Incredibles or Wreck-It Ralph. The alien armies are intending to invade the Earth. They spread a strange virus spreading very quickly. Many people who intend to stop them have been turned into evil men, including superheroes. They are all over the Earth, across the street, destroying everything. Being a superhero, you have to find other people like you, destroy the aliens, protect everyone on Earth. Disney Heroes: Battle Mode has turn-based gameplay. First, you have to create a team of three characters in the game. 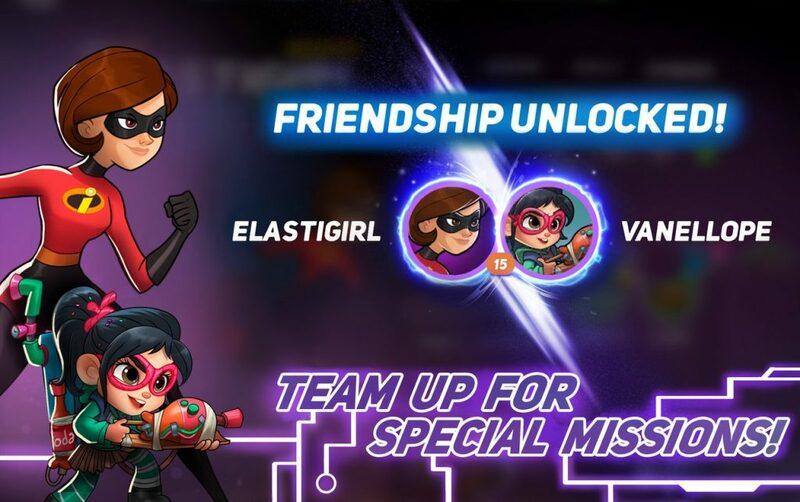 These characters may be family members of Superheroes or Frozone in The Incredibles, the big guy of Wreck-It Ralph or Vanellope, Judy Hopps, Nick Wilde and more. As I know, the current version has 15 characters for you to unlock. In addition, the publisher is actively updating many more interesting characters in the next release. Each character has a different attribute and different power. In addition to unlocking your favourite characters, take a look at each character’s stats to see if you need them in the squad. I very like Frozone. He is funny, cool with freeze ability. Also, each time you level up you can upgrade the strength of the character so they are more powerful, more comprehensive. Do not forget the diverse equipment system of the game. 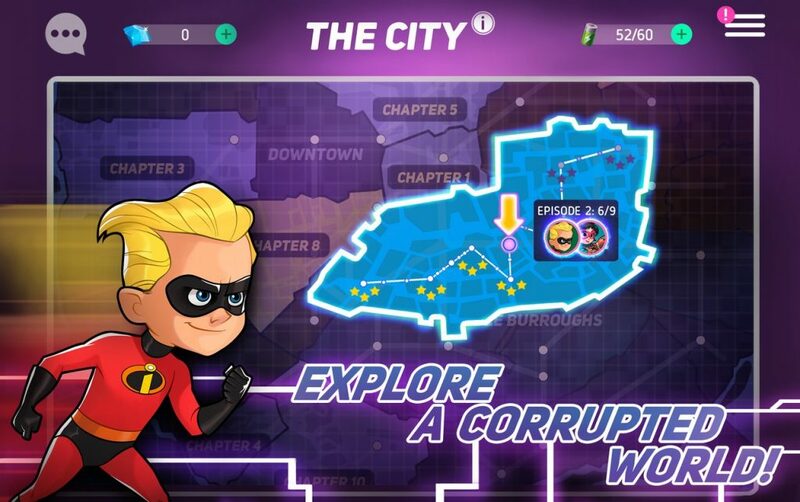 You have to go through each level of Disney Heroes: Battle Mode, corresponding to each location in the city. Each level has 3 different stages. Use your squad, destroy all enemies, you will be the winner. On the other hand, if your whole team is out of blood, you will lose and have to play again at the beginning of the level. Your enemies can be aliens, monsters or even superheroes like Mr.Hogenson in The Incredibles. Design your squad to be able to conquer all challenges in this game. I think the full use of the power properties such as defence, damage, magic, … will make you win easily. I feel the game is not much tactical. The stronger you are, the higher your odds of winning. You do not have to take too much control, just pick skills for the characters to do it. This somewhat reduces the fun of the game, but it OK.
Also, pay attention to the rage. After fighting for a while, your character will gain energy. Full of energy, they will launch special skill, dealing a lot of damage. Disney Heroes: Battle Mode has a nice graphics with cartoon style. Shaped characters are very standard, like relative to the original version. In addition to the characters of Disney, there is the participation of the Pixar character, which brings the special fun of this game. You will enjoy many familiar scenes during the battle. Overall, Disney Heroes: Battle Mode is not so good and perfect. However, the game has succeeded in creating a lot of charms and surprises for the players. This game is very playable, completely free. Why don’t you play it today? 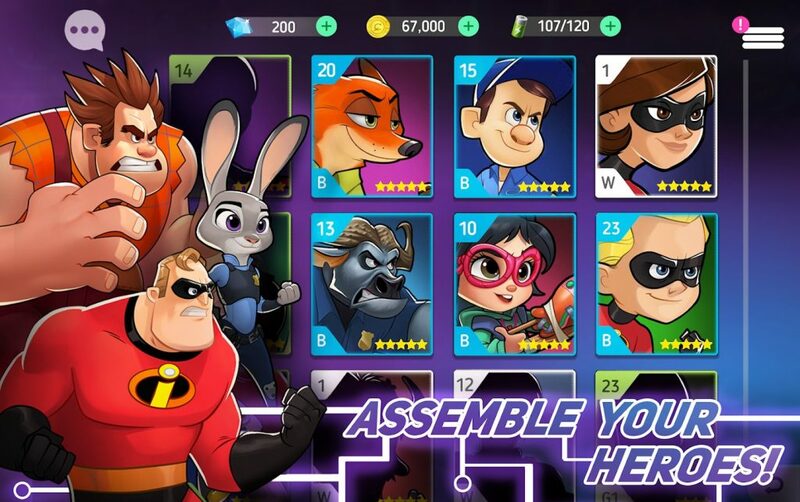 Disney Heroes: Battle Mode APK is ready to download! Depending on your needs, you can download Disney Heroes: Battle Mode MOD APK or Disney Heroes: Battle Mode Original APK. Or install from Google Play / App Store if you want. Crossout Mobile: Build your machine, win your battles!